Detail : Paul's thirty-third single. Band included, Andy Mackay, Steve Gadd, Eric Stewart and Ringo Starr. 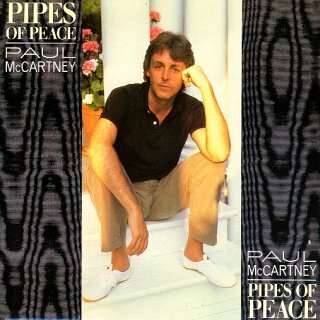 Recorded in September 1982 during the "Tug Of War" sessions, "Pipes of Peace" is obviously a counterpoint to it. With an obvious attempt to cash-in on the public's love of a "deep and meaningful" song to be the Christmas number 1, this is released just in time for the Christmas market. To go with it a heart-rending video is shot at Chobham Common in Surrey, which depicts the famous Christmas day truce between English and German troops in 1914. It is produced by Hugh Symonds and includes over 100 extras. For realism, Paul even had his hair cut short just for the shoot. It does the trick and Paul has his third number one. The single was released in a picture sleeve, with the rear being exactly the same as the front, except for some very small print about the B-side etc. The photograph is taken by Linda. And once again "Utopia" (with the harp) appears in the run-out groove.